John Henden is an internationally renowned author, trainer and therapist. Prior to founding the John Henden Consultancy he worked in NHS mental health services for over 20 years, as both a manager and practitioner. He is a member of the British Association of Counselling and Psychotherapy (BACP) and the author of Preventing Suicide: The Solution Focused Approach (Wiley-Blackwell, 2008). Preface – The Book's Purpose. How to Use This Handbook. Section 1: Dealing with "Triggers". Section 2: How to Deal with Flashbacks. Section 3: How to Deal with Unwelcome Thoughts. Section 4: Dealing with "The Lows". Section 5: Dealing with Sleep Disturbance. Section 6: Living Life to the Full (or as Full as Possible). Appendix A: The Evidence Base for Solution-focused Therapy. Appendix B: Helpful Questions and Statements from the Worker. Appendix C: What Service Users Have Found to be Helpful in This Work. Appendix D: How to Avoid Re-traumatisation and Re-victimisation. Appendix E: Blocks to Disclosing. Appendix F: The Three Stages: Victim – Survivor – Thriver (Living Life to the Full, or as Full as Possible). Appendix G: Benefi ts of Doing This Important Work. Appendix H: Reassuring Things for Servicemen to Know. 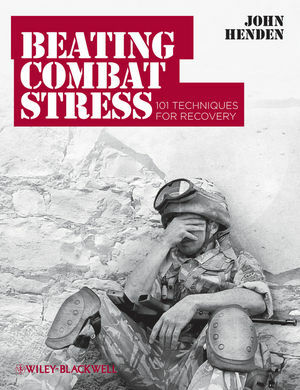 "John Henden provides a much-needed perspective for addressing the problems of combat veterans. Those who have not worked with veterans will find this invaluable, and those who are experienced in working with soldiers will find new ideas in his practical suggestions." "At last! A nuts-and-bolts manual for those coping with normal reactions to abnormal events. John Henden delivers exactly what he says: 101 techniques of hope and help. This book is not a panacea – but it is the best of ‘tailor-made’ and ‘off the peg’ in one place, with something for everybody." "Those whose injuries we see are just a small proportion of those who suffer in the course of duty. John Henden has consulted widely, thought carefully, and offers compelling advice in an area of life that has become much more open to receive it. In this regard he is a man for our times, and this book is a most welcome product. If used as intended, hope will be restored and many lives transformed."